Fact-Check - How True Is Nnamdi Kanu's Claim Atiku Is From Cameroon? 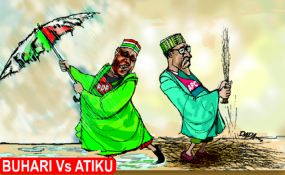 The Indigenous People of Biafra, IPOB, has described the ongoing altercations between the ruling All Progressives Congress, APC, and the opposition Peoples Democratic Party, PDP, over the nationalities of both President Muhammadu Buhari and the former Vice President, Alhaji Atiku Abubakar as unnecessary as both "are non - Nigerians." IPOB made this known in a statement signed by its Media and Publicity Secretary, Comrade Emma Powerful. It stressed that the pretense by those in positions of authority that things were normal in the country "with the current level of injustice, poverty, pain, insecurity, hunger and oppression," amounted to a recipe for disaster. It stated that its leader, Mazi Nnamdi Kanu had earlier warned Nigerians that the two Fulani political gladiators were non - Nigerians, even as the occupant of Aso Rock was now a "Sudanese." The statement read in part: "With the trend of ongoing events in Nigeria, it is now clear to all and sundry that any word uttered by our leader on Radio Biafra is the unquestionable truth backed up by irrefutable facts. Atiku's nationality debate attests to this. "On Radio Biafra, every lecture on history, social policy, economy, politics and law is designed to liberate the poorly informed half-educated masses of Nigeria from the darkness and oppression of the people. "Those who over the years derived joy in propagating the lies that Radio Biafra is about propaganda and hate speech are the ones today relying on it to get factual information on constitutional law in Nigeria. Senior lawyers in Nigeria now depend on Nnamdi Kanu to tutor them on constitutional law and the dysfunctional legal system of Nigeria. "Those that referred to IPOB as miscreants are the same people now quoting and referencing the speeches of our supreme leader, Mazi Nnamdi Kanu in their legal depositions. "Radio Biafra has now been confirmed beyond every doubt as a citadel and arguably the best (,open) university in Africa as events surrounding Atiku's nationality attests."